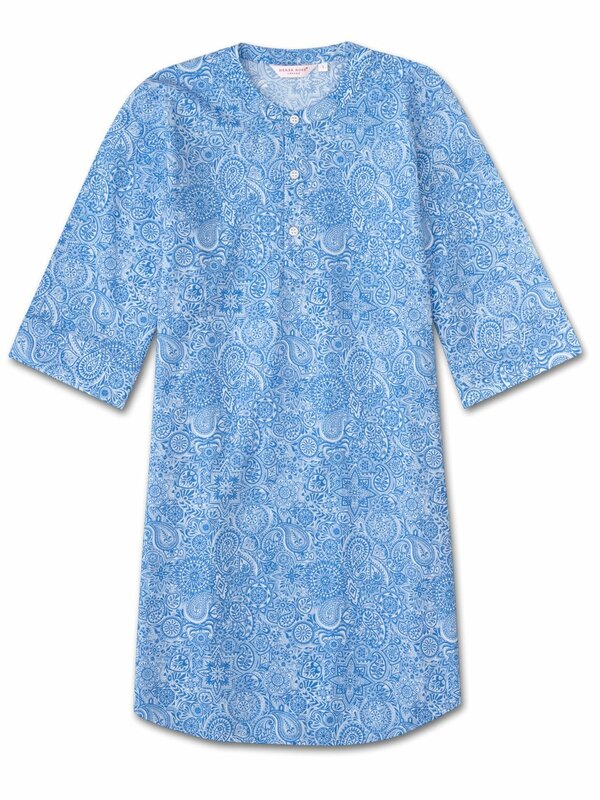 An intricate paisley design is printed in a light blue on our signature lightweight cotton batiste white fabric. Designed in-house, this eye-catching print brings vibrancy to our new kaftan nightshirt shape. Although of Persian origin, the paisley design takes it name from the Scottish textile manufacturing town where paisley designs and other textiles were created during the 19th century. The elaborate pattern is digitised before being printed for a modern interpretation of a classic British design that will wow for years to come. Made from our signature cotton batiste - a lightweight and luxuriously soft material - this pure cotton fabric is a firm favourite with our customers thanks to its breathability, lightweight properties and luxuriously comforting feel.